Here I attempted to apply the devore paste from the back, and as you can see, it was less than successful – this was meant to be a circle, but even after much enthusiastic scrubbing the chenille did not come off completely. Either I did not heat it enough for the burnout to happen, or the devore paste did not penetrate the fabric enough to burn out the chenille. Â Maybe a bit of both. 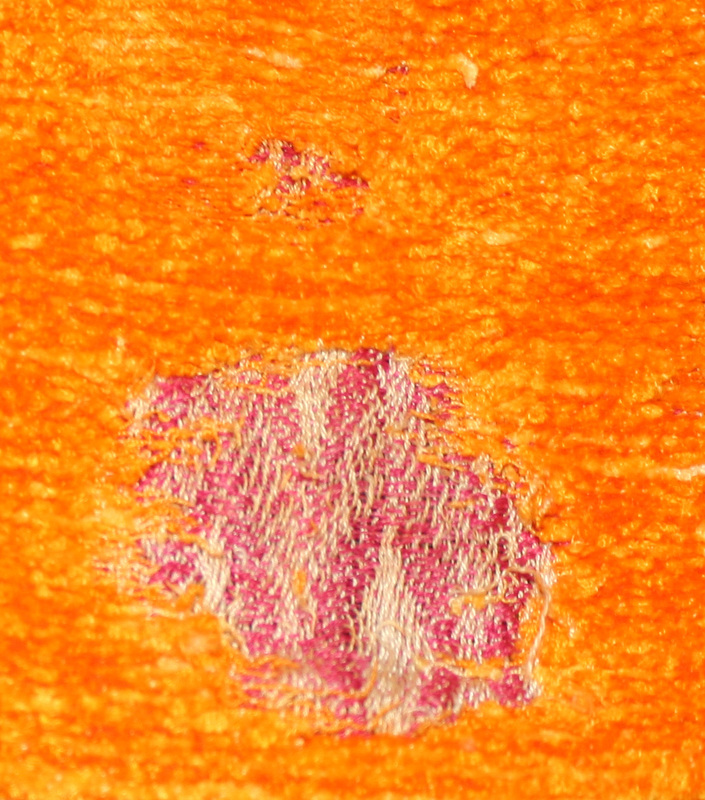 However, this raggedy sample is still super-valuable as a “proof-of-concept”: the chenille does burn away to reveal the pattern beneath, and the devore paste does not affect the colors (something I was worried about earlier). Â The rest of it will be a matter of working out how to apply the devore paste, how much thickener to add, etc. 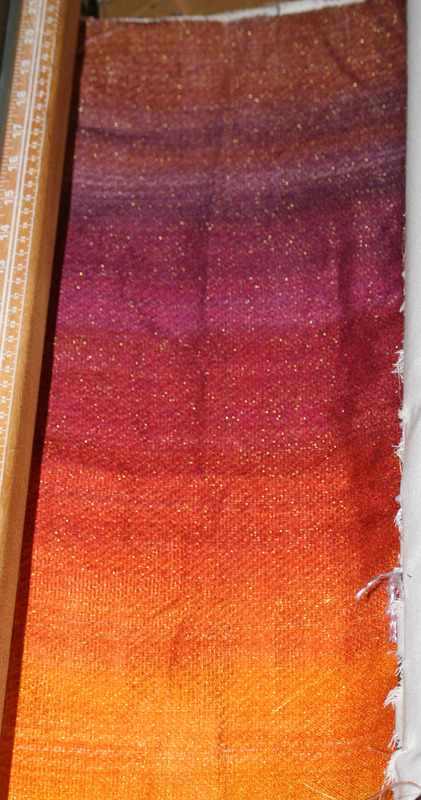 Â And experimenting with shibori and other kinds of bound resist. My plans for this weekend have mostly been turned upside down by the weather – I had been planning to do a lot of surface design experiments, but it’s forecast to rain all weekend. Â Rats. Â It rains so seldom here (especially in this dry winter) that I’m always surprised when it happens – it’s not a bad thing, because we badly need rain this year, but it’s certainly inconvenient for working outdoors. Not a whole lot of excitement for the weekend, but maybe that’s a good thing. Â The house closes in mid-April, so between mid-April and mid-May (when we move in) there will be an awful lot of packing to do! 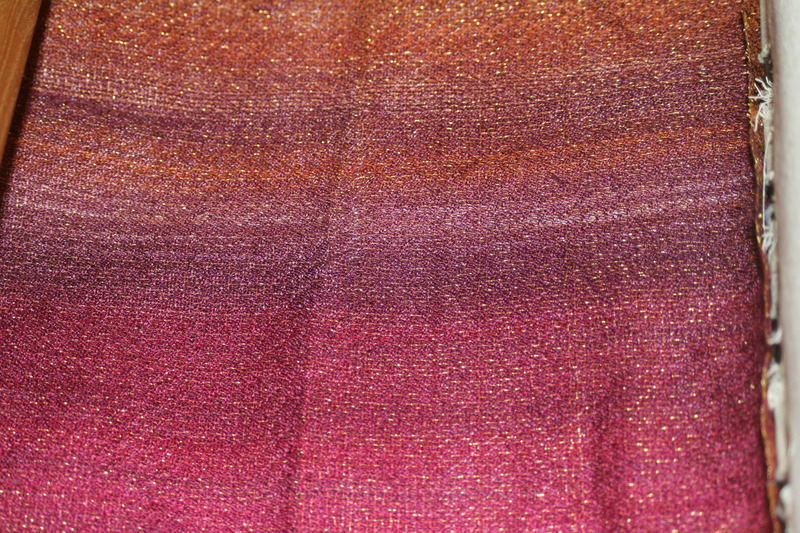 I finished weaving the first sample with a painted warp and knitted blank yesterday.Â I love it! 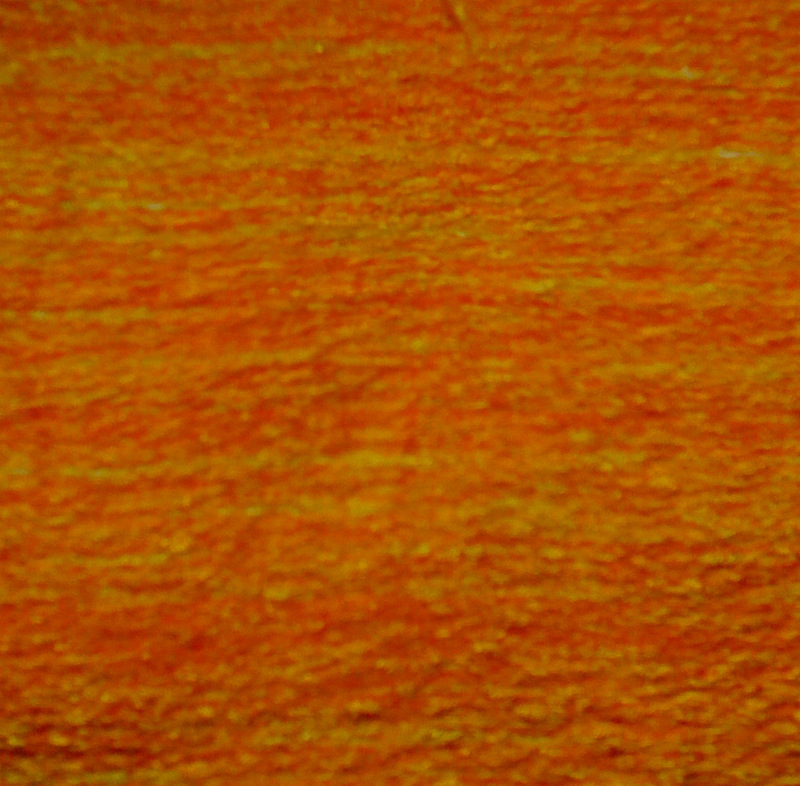 The striations in color don’t bother me at all – they add interest and, because most of it is burned away, the visual impact will be significantly less post-devore. 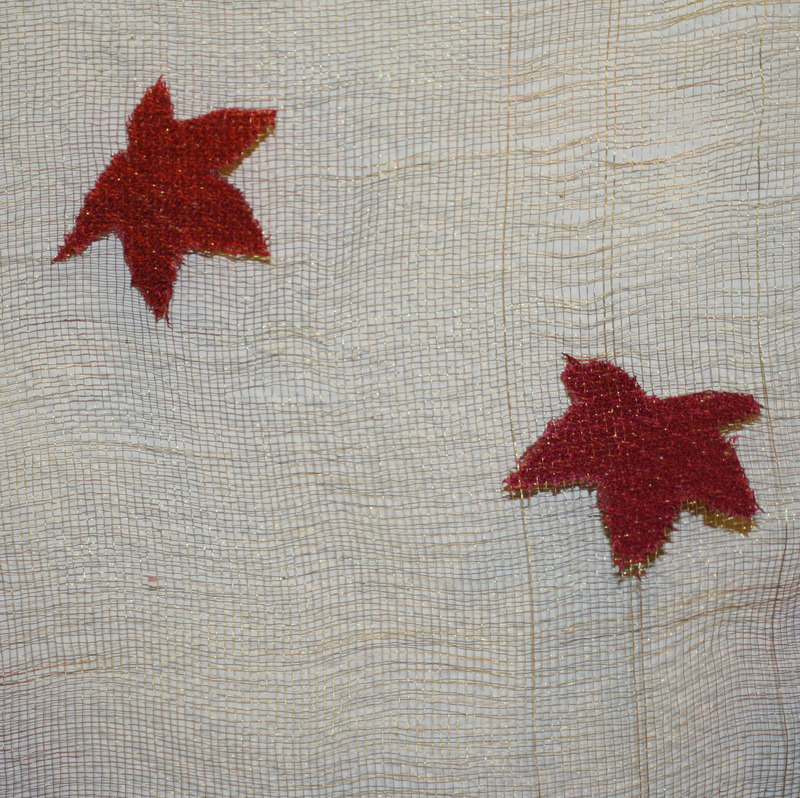 I like this!Â There are a number of obvious flaws that need correction – the stems disappeared, definition around the edges is poor, there are doubled threads in the gold warp, and so on – but leaves are floating on the gold “lace”,Â and the grid of gold thread is surprisingly stable.Â So stable that I’m wondering whether I partially melted the polyester – I used an press on damp fabric, which compressed the fabric and heated it at the same time, which may have set permanent pleats in the polyester thread, holding the grid in place. The freezer paper did not adhere well enough.Â May iron it longer next time, so it adheres better to the fabric. 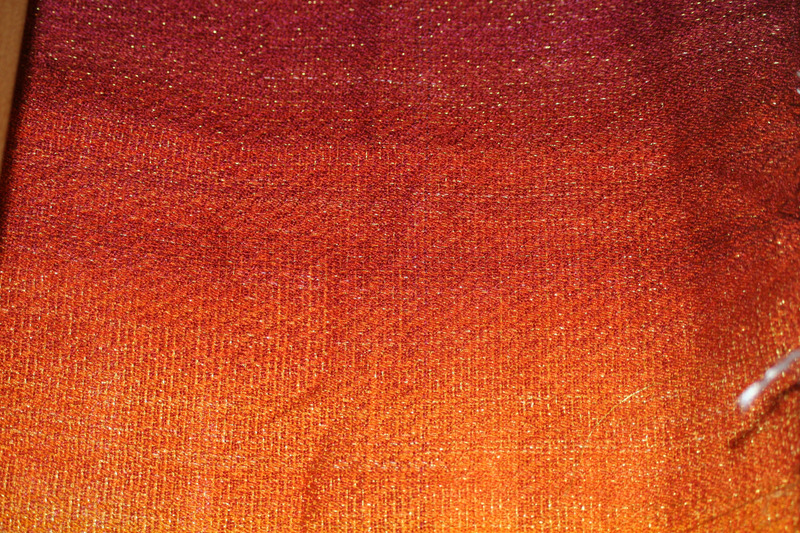 Devore solution may have been too runny – though I don’t know; if it had been thicker it probably would not have penetrated to the back of the fabric.Â Will have to experiment with this some. Floats in the draft may have been too long, contributing to poor edge definition.Â May have to experiment with this.Â More gold threads (1 out of every 3? 1 of every 2?) may help with this as well. Whether to replace the pattern with a pattern that has shorter floats. 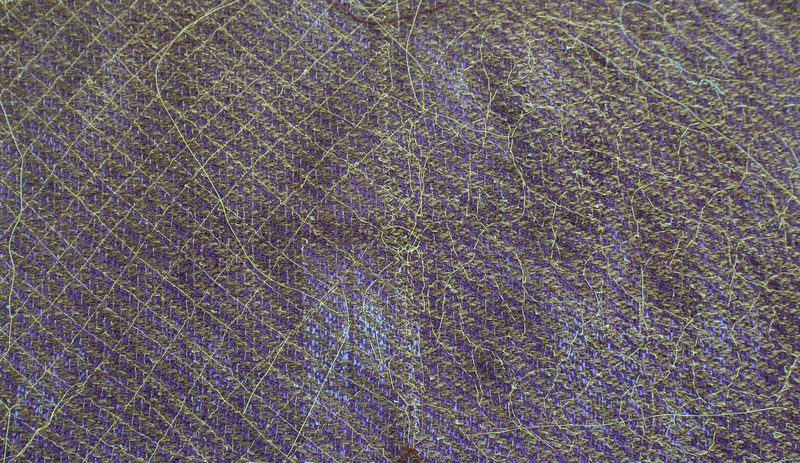 The current pattern has quite a few 5-thread floats in warp and weft; this produces poorer definition around the edges of the burnout sections.Â If I reduce the floats to 2 or 3 threads, I’ll get better definition (at least in theory).Â The downside is that I’ll get poorer contrast between sections.Â Only a test will show whether it’s worthwhile. What to use as background.Â I am thinking either a color gradation from green to brown (as originally planned) or shades of pale blue.Â The green/brown will harmonize with the colors, the blue will make the oranges, yellows, and reds really “pop” (because blue is the complement of orange), but will produce a cooler feeling in the piece overall.Â I want a warm “feel” to the piece – a cozy log fire rather than chilly gray days.Â I will dye pieces of commercial fabric to test out those color combinations. Whether to thicken the devore paste more.Â I am almost out of Fiber Etch (a premixed solution), so will have to start mixing my own.Â This is something of a pain, but also means I can make it thicker if I like. 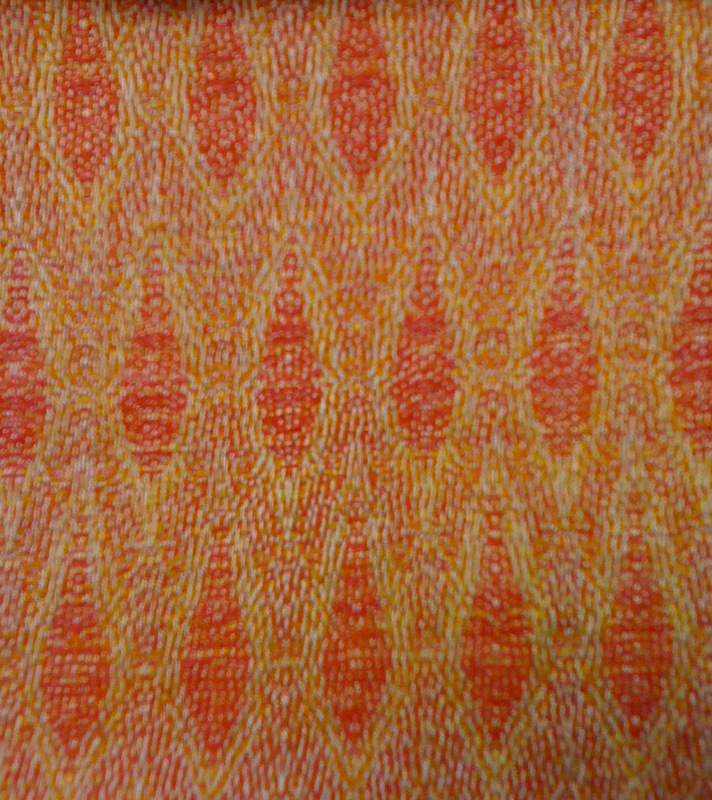 All in all, this was a successful sample – I’m very pleased. 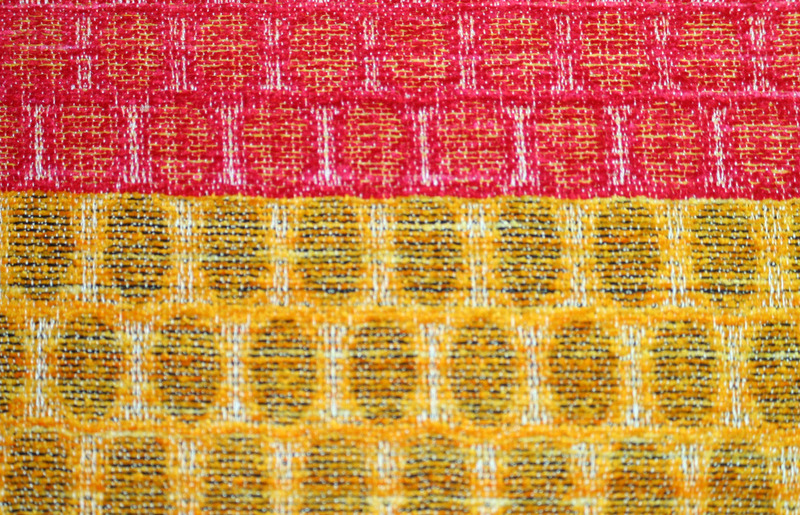 Next steps are to wind the second knitted blank onto bobbins, adjust the warp (some sections need to be re-aligned), and weave up the second warp sequence.Â This section of warp has gradual color changes, rather than the sharp contrasts in the first section, so will look somewhat different, even without the knitted-blank changes.